Looking for a last-minute Christmas gift for a train-spotter? Got a budget of hundreds of thousands of dollars? Then splurge and buy them a home in this new development in Caulfield East. Urban Art Apartments is an artistic, inspired residential development in Caulfield East which is surrounded by lush greenery and designer art pieces. The development will feature a range of 34 architect designed 1, 2 and 2 plus study bedroom apartments. Each apartment will include European stainless steel appliances, split system heating/cooling and acoustically treated. The large, beautifully landscaped communal courtyard garden is an ideal place for all residents to enjoy the sun or you can gather with friends in your own private terrace. Visitor bike parking in basement and on ground level. All apartments have one car space. It sounds good… until you realise the precise location, which is smack bang in the middle of the junction between the Frankston and Dandenong train lines. I suspect that even with the best sound-proofing in the world, that is a location only a train-spotter could love. Have a Merry Christmas everybody. I’m more intrigued by the cache of “European stainless steel appliances”. Better than those Australian or American ones, eh? What?! Merry Xmas Daniel to you and the family. I wouldn’t trade living next to the railway line for anything now. Awesome. When you get the Steam Train going by it’s just magical. Friends have just moved to a place backing onto the Frankston line less than a kilometre from the vacant site. Inside with windows and doors shut, you really don’t notice the trains passing. The fairly new apartment building in Flinders Street between Flinders Street Station and Southern Cross is very close to the train line. I can’t imagine that the balconies facing the train line would be usable. @Ian, European appliances (especially brands such as Smeg) have a certain prestige in Australia. 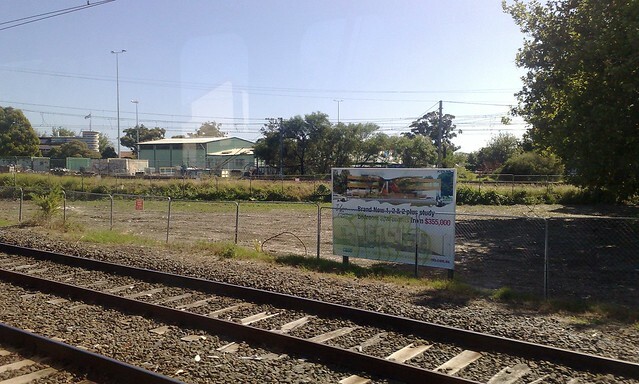 @Andrew, yeah, I lived for a while in my youth next to the Dandenong line. You get used to it (apart from when a freight train drowns out the television). Merry Christmas Daniel, and to all the readers of this blog. We may not agree on much, and we’ve had some significant disagreements in political matters in the last, turbulent, year, but we can do it constructively. May you all have a Merry and Holy ChrIstmas! Double the train fun! And it would surely come with the squealing sounds of trains changing tracks and scraping on them as they navigate the bends. I think I’ll pass. Yikes! “Close to public transport!”. Merry Xmas, Daniel and family. I’ve really enjoyed reading your blog for the last decade (double yikes!!!). To an American “European appliances” conjures up an image of tiny appliances to fit in your tidy and efficient (very small) kitchen. Even regular Australian appliances are smaller than what is found in a typical American home or apartment. I also find it amusing that they say “architect designed” to try to sound more exclusive and snooty. Who else designs buildings and draws the artist’s impressions? Even the most plain apartment house was architect designed. Accoustic treatment is nice and all but it doesen’t help much when you would like to open the windows. At least they can proudly and truthfully boast “close to public transport”. I’ve * always* been amused by the term “architect designed” being used in a boastful way. It doesn;t happen much in Britain any more but it used to be quite regularly used by people trying to convince themselves that they were “a bit better” than anyone else (ie 99% of Britain’s population!). I always used to think it implied that the rest of us lived in houses designed by butchers or something”. My assumption is that it means the design is specific, not just a cookie-cutter design plonked onto a spare bit of land without regard to the specifics of the location, eg north-facing (in the southern hemisphere) outdoor living areas and so on. Very interesting. 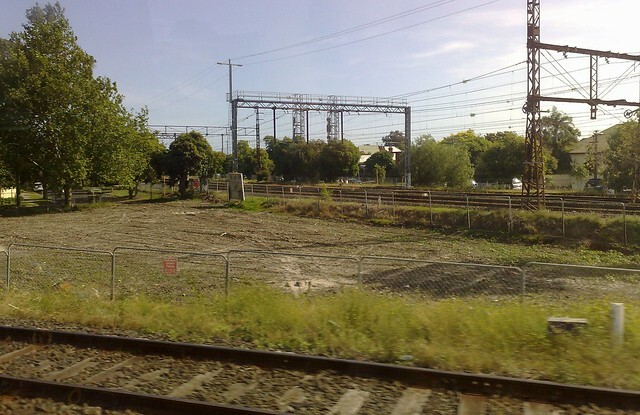 I also noticed those houses were now gone, and drifted into nostalgia for the days when I tended to park beside them on the road just there (for free and with no time limit, but with the disadvantage of having to climb a wall and dodge the trains) when attending Monash on the north side of the fork. Curiously, Google Maps’ older images confirm that that massive pale structure (above) backing onto the other side of the Dandenong line is also a quite recent development over the top of a still larger number of old residential blocks. Perhaps already populated with trainspotters, or close to it? I want me a couple of thoose hologram trees. It’s a long walk back to the station though unless they put a pedestrian underpass in. A friend used to live next to the race course and the horses made more of a noise when they went past. The old house there was a weatherboard one with a swimming pool right in the corner for many years (water a very dark green for much of that time), which was more visible from the Dandenong Line side. Never saw anyone swimming in it over that time – used to wonder if they had a slight privacy issue with trains full of people staring in!! Blues Brothers? I think more of the car chase scene in the former Dixie Sqaure Mall in southern Chicago. Amazind the derilict mall is still (sort of) standing 30 years later!! As well as the Blues Brothers, another movie where characters are based in anapartment that’s really affected by the trains, is Seven, where they wondered why the agent only whisked them through the apartment before they moved in.